MIXED MEDIA ON PAPER, SIGNATURE AND DATE DIE-STAMPED IN THE LOWER RIGHT CORNER BY THE ARTIST, 28" BY 33"
Since I first visited Jerald Melberg Gallery in 1999, I've become quite familiar with the works of Ernesto Berra... Jerald has represented him for quite a long time. However, even though I've seen many of Berra's works over the years, none of them ever really appealed to me. If you asked me why, I couldn't tell you; there was just something missing. Then, in June of 2005, I visited the gallery to see a new show of Berra's work. I didn't expect to see anything that I'd like, but quite the opposite happened: I liked every single work in the show. Of all of the works, this one spoke to me the loudest, and I knew I had to add it to my collection. Basically, this work is comprised of a few sheets of various types of paper and corrugated cardboard. The large sheet was then worked over with what looks like spackle or gel media, and then systematically abused (perhaps "weathered" might be a better word) before being painted. Finally, a series of (random? perhaps they represent grafitti) letters and numbers were added near the bottom of the work. 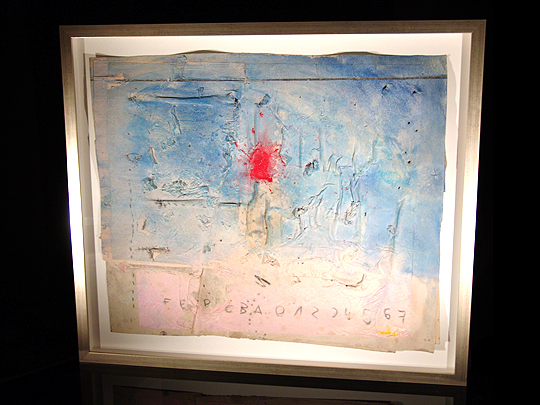 The title, Muro Azul / Rosa Rojo, translates into Blue Wall / Pink Red... most of Berra's works are similarly literally-titled. The resulting work appears to me to be quite architectural in nature, and it should: The work is inspired by the decaying architecture of Cordoba, Argentina, Berra's home. This work is really three-dimensional... not only is the surface of the work heavily textured, but the sheet of paper and cardboard is itself distorted. I really like the combination of abstract and architectural elements in this work, as well as the subtle-yet-vivid coloring. The idea of painting something that's undergoing a more-or-less natural process of decay is also pretty interesting to me.